World Cup-winning coach Vicente del Bosque has some advice for sprint king Usain Bolt's new Australian club -play him in defence. The Jamaican superstar has been handed the chance to train with the Central Coast Mariners for an indefinite period in a bid to prove he has what it takes to earn a professional playing contract. The eight-time Olympic champion made his debut late last month in a 20-minute cameo as a substitute during a friendly, starting in his favoured left wing position. He nearly scored but tired quickly and admitted he was not match-fit, with Australian pundits saying he had plenty of work ahead to make the grade. 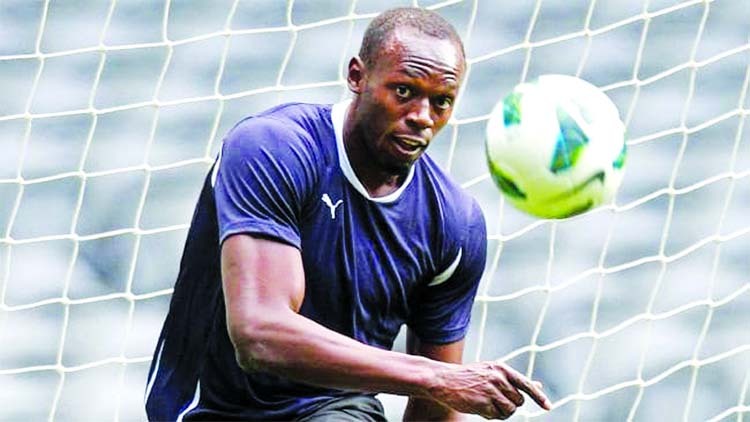 Del Bosque, whose eight-year reign as Spain coach ended after their last-16 exit at Euro 2016, said it was possible Bolt could fulfil his dream of becoming a footballer, despite being 32. "For a team that counter-attacks hard and transitions quickly into open space, sure (he would fit in). It would be possible, of course," de Bosque, who guided Spain to the 2010 World Cup title, told the Olympic Channel. But he suggested the 100m world record holder would be better in defence than up front. "With space, he could be a very good footballer," said del Bosque, who also steered Real Madrid to Champions League success. "He could be a full-back that covers a lot of space, but it depends, because it's not just about covering 100, or 60 or 70 metres of the pitch. "It's about doing it many times over and that requires stamina which I don't know whether he has or not - although I'm sure he has prepared. "Without a doubt as a full-back, with his back towards the crowd and the touchline, that's where he would be most useful." Bolt, who retired from athletics last year, has previously tried out with clubs in Germany, South Africa and Norway, to no avail.